On December 13th, 2017, the last two segments of the 50m diameter primary surface of the LMT were installed. On December 13th, 2017, the last two segments of the 50m diameter primary surface of the LMT were installed. 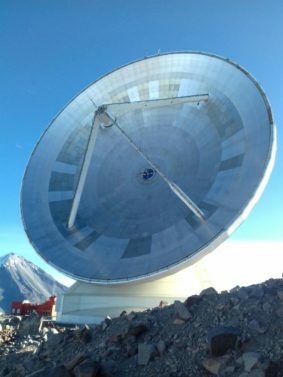 This important milestone in the history of the LMT, represents an improved sensitivity, mapping speed and angular resolution of the telescope. The installation of actuators (in segments of rings 4 and 5) to provide a complete active primary surface, and global alignment of segments is in progress. In January 2018, after commissioning activities, the LMT will start Science Observations taking advantage of the full 50m diameter primary surface for the first time.